In the Manifesto, interlaced beside this older idea and going beyond it, was the beginning of a different understanding. “The essential conditions for the existence and for the sway of the bourgeois class”, Marx wrote, “is the formation and augmentation of capital; the condition for capital is wage-labour.” The street artists of May 1968 were to state the same idea more succinctly: “your boss needs you; you don’t need him”. “Wage-labour”, the Manifesto continues, “rests exclusively on competition between the labourers. The advance of industry, whose involuntary promoter is the bourgeoisie, replaces the isolation of the labourers, due to competition, by … revolutionary combination, due to association.” It was not the decline of the working class into poverty that would pave the way to triumph but its organisational ascent. For over a century, Marxism derived its appeal from what was seen to be its founders’ accurate prediction that the workers would rise and limit the power of capital. Revolutionary politics has lost credibility in an epoch of workers’ defeats. Strike days have fallen from 10-20 million per year in the early 1970s to 440,000 in 2013. In 1974 around 8/10 UK workers were covered by collective bargaining, it is now under 3/10. With workers’ losing, the rich have felt no limit in advancing their own interests. In the US, the top 0.1% now holds around 25% of private wealth. In a typical UK business in 2000, the top managers earned 47 times the lowest-paid worker. The ratio is now 1:120. An alternative way to read the past forty years would be to say that through two centuries the working class has been renewed as changes in the organising technologies of any one decade brought new groups of workers into the centre of working class life. In the early years of the nineteenth century, the technology which most other businesses wanted to was the cotton factory. The face of labour was the mill workers who struck during the Chartist General Strike of 1842. The car factories of the interwar years made Fordist methods of management general. Part of the Fordist template was a hostility to unions; the move to keep the car factories union-free was broken by the sit-down strikes of 1934. It was the same in the 1960s with the adoption of union methods by low-paid employees of the state – in schools, local government and hospitals. This pattern of new industrial techniques enabling new generations of workers to move from the periphery to the centre of working class experience continued until the 1980s. New technologies have since tended to atomise workers’ cultural and social life, while the number of junior managers has proliferated. Yet despite the present neo-liberal hegemony, the victory of capital could only ever be temporary. The greater the extent that the lives of the wealth spiral away from everyone else’s, the easier it must be for workers again to see them as their clear enemies, and therefore for this stalled cycled of working-class renewal to begin again. The command techniques of high Stalinism will not attract the generations who have grown up the other side of digital media, with its constant (if unsatisfying) allure of choice. Nor does it help to say that the working-class is now too divided for anyone on the left to represent a significant fraction of the class, but, that weakness aside, we must retain the ambition to build (in some, better-organised future) “a disciplined, centralised revolutionary party”. A better alternative would be to look to the parts of the class which are making that same journey that others made before from the margins to the centre of working-class life. A century ago it was the dockers, today it will be fast-food workers, or any one of the millions working on zero-hours or hourly-paid contracts who could – if only they were organised – establish guaranteed hours on a living wage. Socialists should be among them, not as the oppressed’s tribunes (we no longer have to assume that anyone needs a representative to speak on their behalf) rather as midwives of the transformation from a present where socialism is off the agenda altogether to one where it is again conceivable. 125 years ago this year, two of the largest unions in Britain were built from campaigns on the London docks and at the Beckton gas workers. The leader of the Beckton workers, Will Thorne worked with another socialist outside his workplace, Eleanor Marx. She taught him to read; the union invited her on to its executive (the only non-gas worker allowed) as its first treasurer. After the New Unionism of 1889 began, she spoke tirelessly to let other workers know what the strikers had achieved and why they should copy them, “We have not come to do the work of political parties”, she would say, “but we have come here in the cause of labour, in its own defence, to demand its own rights”. 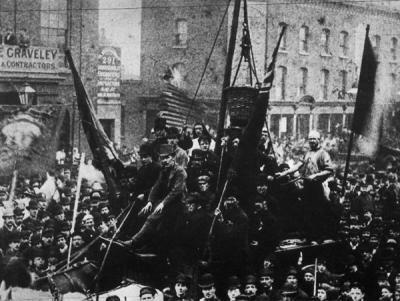 Organisations which grew until they counted members in the millions were built on the message that the strikes of 1889 proved that casualised workers could win. Before it happens, socialists should be the people with a vision of the upturn of the future. Once it has begun socialists should be those who spread the news of its happening as widely as we can. This is the only way to make any ambition for a working class party meaningful again.